This frustration, which compounds an already emotionally charged situation for the borrower, can poison the lender-borrower relationship, increase the risk of default, and impair the reputation of the servicer. While insurers and loan Servicers must ensure that claim funds are used to remediate damage to the home, their archaic processes don’t have to stick with the industry’s status quo. Instead, DIMONT’s solution fixes these inefficiencies by streamlining communications through a common technology platform, which allows our insurance claims experts to manage the process, all while maintaining direct servicer-to-customer relationships that are configurable to the unique portfolio management or customer service strategies of the bank or third-party servicer. 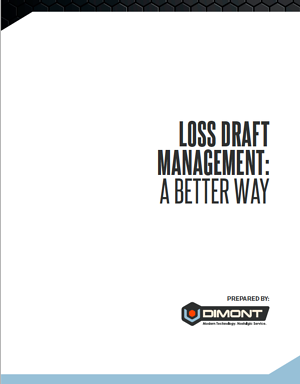 As a result, this loss draft solution promotes collateral protection by reducing delays in the application of insurance proceeds to repairs without process deviation; it enhances customer satisfaction by enabling efficient and effective lender-borrower communications, and it dramatically reduces the costs of this otherwise expensive yet vitally important component of loan servicing. Please enter your name and email to download this white paper now.